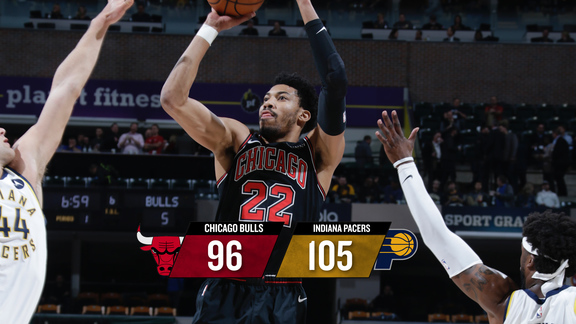 The Bulls snapped a 4-game losing straight and gave their season a glimmer of hope with a 98-96 win over the Indiana Pacers on Tuesday night. In a 4th quarter that featured both teams going ice cold, it was Jimmy Butler who stepped up to play the hero, hitting a 12-foot pullup jumper with three seconds left to break a tie and give the Bulls an important road win with 8 games left in the season. The Bulls (37-37) made up a game on the Pacers (39-35) in the playoff race and took the season-series tiebreaker over the Pacers with the win. Chicago was led by Nikola Mirotic with 28 points (20 in the first half) and 10 rebounds and Pau Gasol with a near triple-double with 10 points, 11 rebounds and 7 assists, though he did have 7 turnovers on the night. Butler finished with 14 points on a relatively quiet night until the game-winner. The Bulls, on the second night of a back-to-back, got off to a solid 12-6 start behind the starting lineup of Rose, Butler, Dunleavy, Gibson and Gasol, playing just their 6th game together. Gasol was involved and active early with a hand in the Bulls first five baskets, including his patented lob to Butler. However, the Pacers behind 9 points from Paul George and 8 points from Ian Mahinmi, got back into the game. The Bulls finished the quarter up by a point. The second quarter saw the Bulls bench continue to play well, including some timely buckets from Doug McDermott, who had successive banks to pour in some points. Nikola Mirotic was on fire throughout the half, as his 6-8 shooting with 5 threes lit up the Bankers Life Fieldhouse scoreboard. Mirotic scored 15 points in the period put the Bulls up 10, but the Pacers rallied with an 8-0 run of their own to cut the lead to 2 at halftime. Mirotic continued to pour int he points, hitting 5 threes and finishing the half with 20 points, more than he had in the last three games combined. Throughout the first half, Rose seemed to be favoring his left arm, using only his right hand on passes and dribbling. He would finish with 8 points on 4-15 shooting. The third quarter was problematic for the Bulls as they fell into bad habits of isolation basketball and contested fadeaway jumpers on offense and giving up offensive rebounds on the defensive end. The Pacers jumped all over the Bulls with a 9-0 run to stretch their lead out to 7 before E'Twaun Moore hit a three pointer to stop the bleeding. The Pacers continued to ride a 44-26 points in the paint advantage after 3 as they took a X point lead into the final quarter. Gasol finished the third flirting with a triple double with 10 points, 10 rebounds and 7 assists, but 5 costly turnovers. The Bulls continued their strong play into the early fourth with a deep Mirotic three giving the Bulls a 5 point lead and a 15-2 run of their own. With Gibson suffering a rib contusion and unable to return, Cristiano Felicio came in and made an immediate impact with 8 points and 5 rebounds in just 6 minutes. After taking a 93-86 lead on a Felicio followup, the Bulls went ice cold and did not score apoint for nearly 6 full minutes. After Indiana rookie Myles Turner hit a pair of jumpers to give the Pacers a 94-93 lead with 5 minutes left, neither team was able to find the basket from there for another three minutes. Mirotic finally broke the streak by hitting a three to tie the game at 96, but the teams exchanged an array of missed shots and turnovers down the stretch until Butler's game winner. Pacers forward C.J. Miles missed a long three at the buzzer to give the Bulls the win.